Guns N’ Roses was made up of five wildcards that a lot of record labels viewed as a liability, reluctant to give the group a chance to make a name for themselves. That changed on March 26, 1986 when they signed with Geffen Records by way of Tom Zutaut. 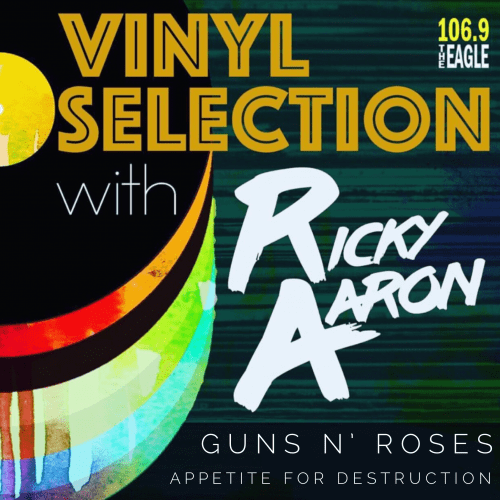 A little over a year later, their debut album ‘Appetite For Destruction’ was released and the band hit the road, only to be stalled by poor record sales. But after convincing MTV to play the music video for “Welcome to the Jungle”, the group exploded. ‘Appetite’ would go on to smash records, becoming the biggest selling debut album of all time. 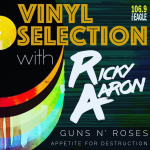 Join Ricky Aaron as he guides you through the album, from the one of the greatest openers in “Welcome to the Jungle” to the very risque “Rocket Queen” closer for this week’s Vinyl Selection!